Since 0.92(? 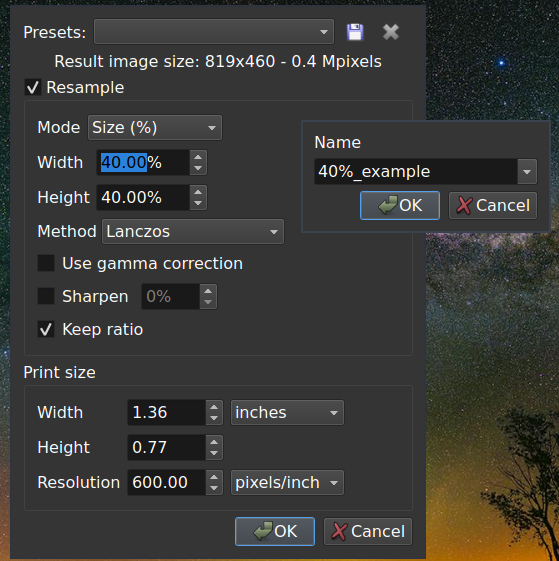 ), presets saved through the "Resize" dialog box are not restored properly. 4. 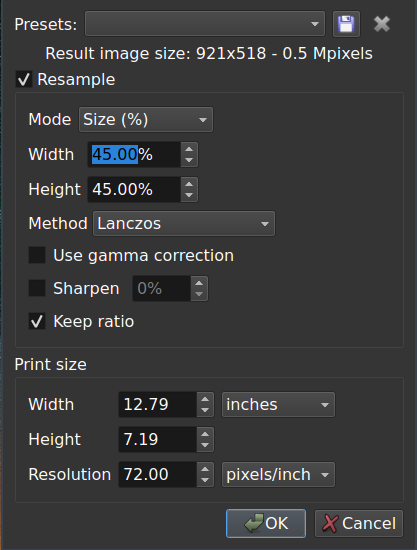 The preset is either saved with the wrong values (none?) or restored with the wrong values. Not sure if this is Linux specific. Can anyone reproduce and confirm? Interestingly, the "Last used" preset also doesn't load the actual last used values, and instead gives bad values. Note: I could not find out where those values are stored on disk, not even through strace. Also, it would be really nice to be able to remove the pre-defined presets completely. It's really annoying to have to browse through all of them to get to my own every time when I know I would NEVER use any of the default ones. Even pressing keyboard keys to get to them is annoying, especially with the new ones which also start with numbers. For example, if I want to get to 25% fast, now I have to press 25 twice because I get 2560x1600 first. Also how many times have I accidentally selected resize to 500% instead of 50%. Quite irritating. 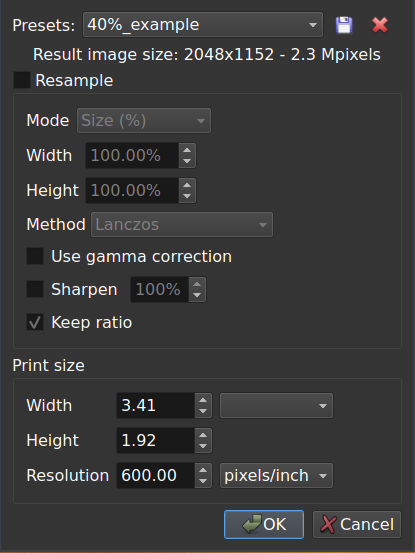 EDIT: for those wondering, there is a way to remove the default resize presets by editing the file "ResizePresets.txt"! Last edited by pangwolin on Thu Jan 31, 2019 7:42 pm, edited 4 times in total. Thank you, I can confirm the bug is fixed in 0.93.